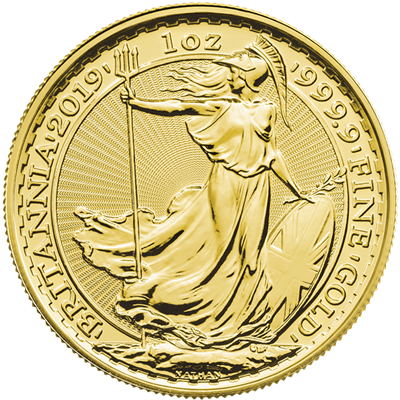 2019 1oz GOLD BRITANNIA £100 coin - CLASSIC DESIGN. The 2019 coins have the 'Classic Britannia Design' on the reverse which was first commissioned for use on the 1987 coins. In totally uncirculated condition, the coin contains 1oz of fine gold as produced by the British Royal Mint. It is also known that only a very limited number coins will be produced with this design, so they will be extremely limited for the 1oz Britannia bullion coin. This is set to be a true collectors piece so get one while you can. Investment quantities are available - for quotes please call or email for current prices. We are currently sourcing these coins to order, so there will be a slightly longer than usual wait for delivery (approx 5 - 7 working days).